A 48 year old man had been followed in our clinic for approximately 5 years. He had previously been treated at another institution after being diagnosed with a malignant glioma after suffering from seizures. 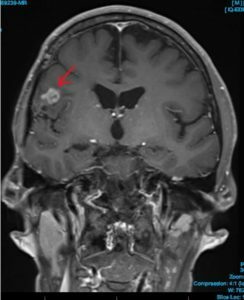 After his initial presentation with seizures, he had surgical resection of a small tumour of the right frontal region, and then this was followed with radiotherapy and chemotherapy. He made a reasonable recovery from this. On routine follow up MRI scans, a new enhancing area adjacent to the resection cavity was identified. Whilst it is very common, if not inevitable, that malignant gliomas will recur after standard therapy, and usually in the surrounding brain, the diagnosis at this point can be difficult to determine. 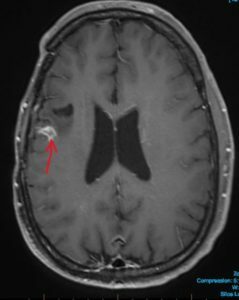 Figures 1 and 2 show the MRI scans which suggest tumour recurrence (Arrow). The diagnosis can be difficult to determine in these situations. Occasionally, “scar tissue” after radiation and chemotherapy can give a similar appearance. Other tests are therefore required and this patient therefore went on to have a FET-PET scan. This is a functional test which is very specific for tumour and if positive, almost always indicates that the lesion seen on MRI does in fact represent recurrent glioma. 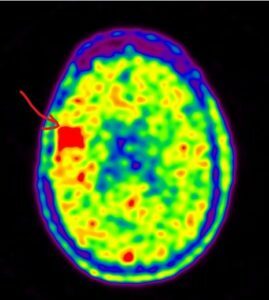 In this case the FET-PET scan was positive, indicated by the area of increased activity (red mass in the corresponding area on this axial view. This test is not available at all institutions and we believe it is a critical to have this investigation available when following and treating patients with gliomas. The patient was entered into a new trial available through the NEWRO Foundation at the Wesley Hospital. This is a world-first trial introducing pre-surgical medical therapy, consisting of a cocktail of medications, aimed at attacking the metabolic functioning of the tumour (the MAC study). The patient then went on to have surgical resection of the tumour with satisfactory results and was discharged from hospital a week after surgery. Pathology testing of the resected tumour confirmed it to be a Glioblastoma Multiforme (grade 4). The patient is booked in for further radiotherapy and chemotherapy appointments. Routine and regular follow up after the initial diagnosis of a brain tumour is vital. Follow up should be conducted at clinics with vigilant and expertly trained clinicians, with access to the latest investigational equipment. Aggressive treatment approaches should be considered in all cases, although it is not always appropriate to pursue these. Access to research trials should always be sought. If research is not being conducted at your treating institution, it is reasonable to question how up-to-date your treating doctors are.